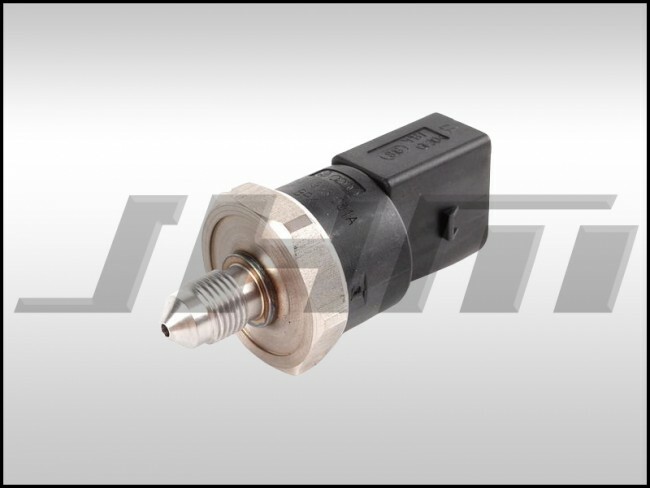 This is a brand new, OEM High Fuel Pressure Sensor (sometimes called the "Thrust Sensor") for the B7-A4 2.0T FSI and 3.2L FSI and the B7-RS4 with the 4.2L FSI V8. This sensor has a protruding cone end that screws into the fuel rail. On the RS4, the original PN for this piece was 06D906051C or 06H906051A. Audi superceded these part numbers to the current part number 06J906051C. On the RS4, this sensor plugs into a fuel line fitting under the intake manifold that goes to the passenger side or bank one fuel injector rail. On B7 A4s, there were a few different part numbers for this sensor depending on the build date of the car. Starting from the earliest there was 06D906051A which superceded to 06H906051A which superceded to the current part number 06J906051C. **NOTE:** On the B7-A4 2.0T (not the 3.2L), there was a VIN split for this sensor between the 2006 and 2007 model years. If your B7-A4 2.0T has a VIN up to 8E_6_400000, this is the part for your car. If your B7-A4 2.0T has a VIN of 8E_7_000001 and up, you need the LATE sensor. The original part number for the LATE sensor was 06J906051B which superseded to the current part number 06J906051D. Please go back one section to find the LATE sensor or search our site using the 06J906051D part number. On either version of the B7-A4 with the 2.0T, this sensor installs in a fuel line underneath the intake manifold, near the rail valve, towards the front of the car.